It is important that you come in prepared for your first consultation for your car accident. On your first visit, you will have a lot of questions that you need answers to and the attorney that you are meeting with will need to have plenty of information in order to answer those questions. Furthermore, the attorney will have questions to ask you to determine whether or not the case should be pursued and whether they should help you with your case. 1. Police report or police report information. A police report will help shed light on what happened, the parties involved, and the insurance carriers involved. If you don’t have the police report yet, bring in the police report number or anything the police might have provided to you. If no police report is made, that is OK. A claim can still be made. 2. Photos of the vehicles involved. Photos of the vehicles will give your attorney a better idea of what happened and how hard the crash was. If you did not take pictures immediately after the crash, take photos of your car at home or at the tow yard before your consultation if possible. It will provide answers to your attorney and will help your attorney answer any of your questions. 3. Photos of any of your injuries. Photos of your injury will help prove how seriously you were injured. Make sure to take photos of your injuries as soon as they appear. The more evidence you have to prove your injury the better. 4. Tow truck information. If your car was towed after a crash it is important that your attorney knows how to locate where it is and get it removed from the tow yard if it was taken there. 5. Tow yard information. If your car was taken to the tow yard, it is important that it gets removed as soon as possible. If you provide your attorney with this information he or see will be able to make sure that the car is no longer accruing fees at the tow yard. 6. Proof of car insurance. Even if you were not at fault for the crash your car insurance may be able to pay you for your claim. Furthermore, if you don’t have car insurance you may not be entitled to get paid for your pain and suffering from the other party. 7. Car insurance declaration. Your attorney will want to know what type of coverage is applicable to you. Even if you were not at fault, your attorney wants to know all avenues to pursue your claim. 8. Gap insurance information. If you owed more than what your car was worth and your car was totaled in a crash, it is important that you have gap insurance and that claim is pursued. Gap insurance will pay for the difference between what the car is worth and how much you owe. 9. Medical records relevant to your car accident. Your medical records are your evidence of your injury. 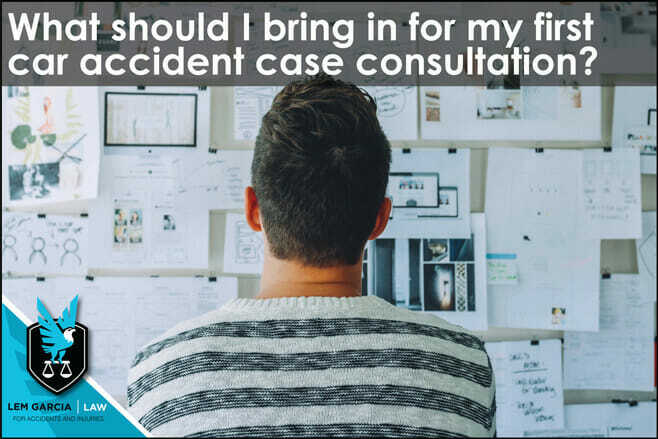 Make sure you can prove to your attorney that you were injured from the crash so he or she will be able to pursue your claim for you to its furthest. 10. Any letters from any of the insurance companies involved. To help your attorney, provide letters from the insurance companies. Those letters contain the adjuster and claim number corresponding to your case. 11. Drivers license. Your attorney will need to confirm that you are who you say you are. 12. Witness information. If liability is in dispute, a witness will prove to be very instrumental. If you provide these documents on your first consultation, it will be very helpful to your attorney. The more information, the better. If you don’t have these documents, make sure to provide them as soon as possible. Car accident lawyer in West Covina, Lem Garcia, can assess your case and answer your questions with the information presented above. If you don’t have everything, that is OK, we will be able to sort out what we need with time and dedication. As always, case consultations are free and without any obligation.